In today’s market, it seems manufacturers are in a race to create the most stunning, eye-catching, crazy packaging imaginable. But one brand has taken a different approach, moving toward the most basic, rustic, organic packaging in the biz! Introducing Leaf by Oscar, a unique project that was born out of the simple necessity to keep a cigar protected, sans cellophane. This unique cigar features an organic band and is wrapped in an additional, raw tobacco leaf, which is then banded a second time. The additional leaf not only does a far better job of protection than traditional cello, it provides a silky-smooth, oily coat to the cigar’s delicate inner-wrapper. 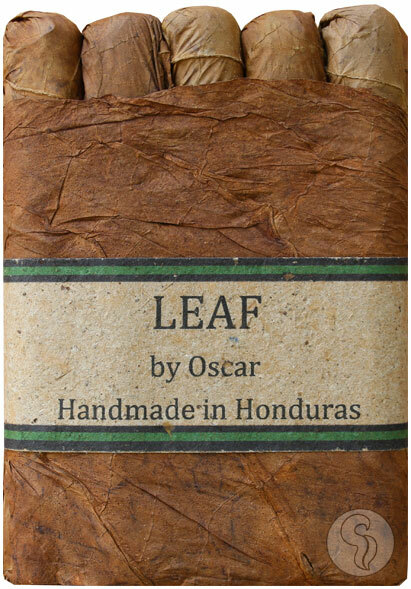 Leaf by Oscar may be the ugliest cigar you ever see—that is, until you remove the outer leaf wrapper! A seemingly perfectly constructed cigar will greet you upon unpacking its thick cover leaf. Here you will find one of 4 blends: Connecticut, Sumatra, Corojo, and Maduro. All have been heavily praised since their launch—starting as a cult hit, these unique smokes are now among the most talked about (and smoked) cigars in the industry.